Please contact me to obtain music, or if you just want more information. Rather than a shopping cart for my music, I much prefer email messages, with as much information as possible. I hope you are interested in acquiring my music with a purpose of performing it. I have accepted commissions from a variety of people for a variety of projects. I am happy to consider just about any resonable idea, let's discuss. Also be aware, I don't do rentals. I want my music to be sitting permanently in the libraries of as many organizations (and individuals) as possible. 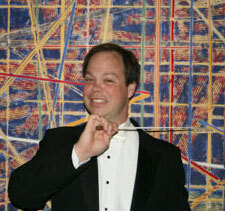 Christopher Stanichar with Mark O'Connor and the Augustana Orchestra.